on the 18th of march, we packed our gear into our camper and headed west to kaprun. at half past six we dropped into the baumbar to sign up for the fwq*** x over at the kitzsteinhorn. we ran into many familiar faces and it was really nice to see everybody again. after the cancellation of the fwq** in kappl due to high avalanche risk the fwq*** x over was the first contest of the season for us. roman still was on the waiting list for the contest at the time and we both hoped that he would be able to make it onto the starting list. it looked bad at first, but then a phonecall brought the change – one of the riders on the starting list wasn’t able to come, so roman was given a starting place and a bib number. he was going to drop in as number 46, whereas i had gotten number 16.
needless to say, we both were very cheerful. we left the bar shortly after and quickly hit up a supermarket to shop for much needed alimentation. then we found a good parking spot for our camper and called it a day, after discussing our lines for the contest. after a night with only a bit of sleep we met up with the others at the gondola at 7am. the sun was already shining when we arrived at the public area to check out the contest face. the start of the contest was postponed for a few minutes at the riders meeting to allow the crusty surface soften up a bit in the sun. perfoming the face check from the judges table. Pic by Daniel Roos. shortly after the face check, we took the second gletscherjet gondola up to the alpine center and started our traverse and hike up to the start of the contest. 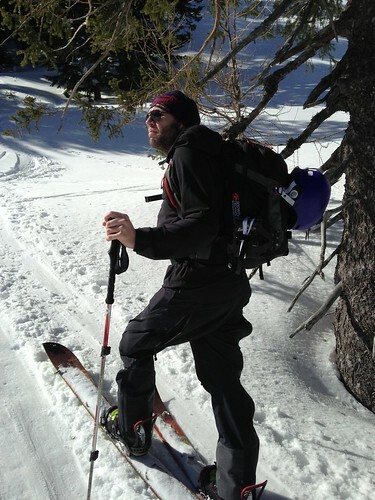 i really enjoyed the hike a lot – i didn’t have a lot of chances this winter to hike / bootpack or go on a splitboard tour, so it was a very welcome change for me to finally be able to move upwards powered by my two legs. during the hike up to the start. Pic by Freezing Motions. the tension rose while we waited for our turns at the start. somehow i felt a bit more nervous than usually. i watched rider after rider drop in and swoosh away through the soft-looking powder and my urge to cruise down the face got bigger every minute. 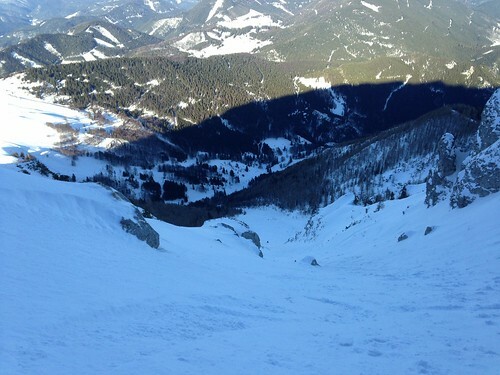 the view from above – conditions looking pretty good! then it was my turn! i strapped in, nearly got a cramp in my left leg, and then it was time to ride! i rode the upper part pretty quickly, jumping over two bumps. i tried to find my way into the couloir i had chosen, but got a bit lost and then had to traverse a bit to get to the right entrance. i was rather happy with my riding in the steeper bottom part of the face. i had two hand drags, but nothing serious. when i crossed the finish line, i was stoked and a bit exhausted, due to the cold i was suffering from at that time. i exchanged experiences with the other riders who were waiting in the finish area for the other women and then moved to the viewer area. a short time afterwards the results of the snowboard women category was shown on the big screen. i have to admit i was a bit bummed to find out that i had gotten second to last. i didn’t understand the result at first, as i hadn’t crashed and felt pretty good about my run. when we talked to the snowboard head judge after the contest, he filled me in that the cause for my bad placement had been the traversing i did in the middle section. well, too bad. it still was a very enjoyable ride! about an hour after my run, it was time for roman to drop in. he rode smoothly and safe, which secured him the 6th place in the end. we went to eat lunch after the end of the contest and then came back for the prize giving ceremony. congrats to the girls who made it onto the podium: Manuela Mandl won snowboard women, Chevy Challis came in second, Mara Neumayr scored third; Stefanie Noppinger won the ski women category, Verena Fendl came in second and – not on the picture – Tijn Vuijk came in third. Pic by Freezing Motions. after the prize giving, khantu suggested that we should put the rest of our day pass to use and go ride. this was nearly the best part of the day – we hiked up to the womens start of the fwq* contest from 2014, everyone picked a point to drop in and then we were able to carve turns into an untouched field. the view was nice up there, our mood was fine and we indulged in the few slushy powder turns we were able to make. can’t buy happiness, but can hike up to ride an untracked field. hiking and riding after the contest. roman cheering, khantu strapping in. khantu riding the untracked field. roman turning a lot more than usually. with this good feeling we left the kitzsteinhorn, checked into a camping site with sauna and then fell into our bed where we slept like babies. at home: gotta keep the burli clean! Categories: adventures, contests, riding | Tags: #JulboAthlete, #LifeIsOutside, burli, camper, campervan, contest, freeride, freeride world qualifier, freeriding, FWQ, kitzsteinhorn, mountain, open faces, PIEPS, snowboarding, x over, x-over ride | Permalink. on saturday, roman and me packed our bags and headed west, as roman had a gig at the winter opening in wagrain. when we arrived there, all the slopes were still green. a few hours later, a soft but constant snowfall set in, which continued over the weekend. roman mixed the opening act (lemo, go check them out) and we all enjoyed a nice evening together. as we had already checked the weather forecast and webcams of the region beforehand, we were prepared to travel further west on sunday to find some freshies. after breakfast, we jumped into the car and off we went to tyrol. at first we were a bit undecisive about where to go, our options were hintertux, stubai or sölden. in the end, we decided to go to the stubai glacier. we were expecting to do warm up runs on the slopes, with nearly no snow offpiste. when we arrived, we immediately bought tickets and took the gondola upwards. we were welcomed by enough snow to do our first turns of the season. it still snowed lightly, with the most perfect snowflakes i have ever seen. in the evening, it was time for pizza and sauna. 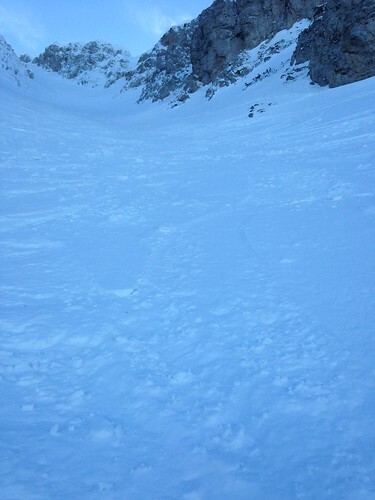 on monday, enough snow had accumulated to ride offpiste without collecting coreshots. i lost track of the number of runs we did, but it was a whole lot. we rode until our legs were properly done and the lifts closed. tuesday came around the corner and we dragged our exhausted bodies onto the glacier once more. at first, the weather seemed to turn out a little better than during the last days, providing us with better vision, but in the afternoon, it was time for the total whiteout. we quit at 3pm, gave our tickets back (boohoo :/) and then hit the motorway. next up – splitboard touring in lower austria on the weekend. hopefully. in january it’s time for the motherland anniversary camp and after that, the contest season will be in full swing. i’m looking forward to the competitions, meeting fellow contestants again, improving my riding and collecting points. also a highlight this winter – the kripp girls camp with melissa presslaber. Categories: riding | Tags: freeriding, Stubai, Stubaier Gletscher | Permalink. on wednesday, we once more enjoyed the great freeriding possibilities in obertauern. after one ride at zehnerkar, we were joined again by our dear friend k. and together we rode zehnerkar two more times. the top entry surprisingly offered a lot of snow, much more than the last time we were there. the middle section before you need to choose your descent route was awesomely powdery as well and the bottom parts were full of tracks, as expected. r. and k. hiking up the ridge to the summit of seekareck. we took the bus back up to obertauern and roman managed to forget his backpack in the bus. while he chased the bus, k. and myself had a great time at the spotival, where 2 bands played a live gig. after about an hour, roman was able to get his rucksack back and joined us for another radler and some celebration. someone was very thankful to have his pack back. live gig by the reggaeband sysiphos. Categories: riding | Tags: freeriding, obertauern, sysiphos | Permalink. we had one of the best – if not THE best – freeride days today at the planneralm. after 2 days with snowfall and fog, it cleared up today so we could finally see in detail where & what we were riding. our boards in front of the jochspitze. we did about 9 runs from the glaeserkoppe (short hike up from the glaeserboden t-bar), first going for the descent straight ahead, then traversing to the left, in direction of the jochspitze. 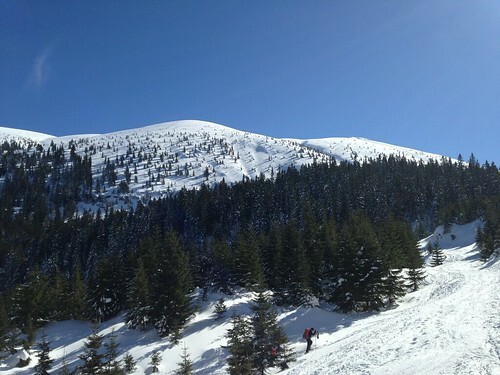 later we switched to the rotbuehel, hiking up for the first run and then traversing into the face from the slope. we happily left our tracks in perfect, light powder. i had the best run of the whole season in the morning, dropping and jumping and speeding down with delicious turns like it didn’t matter. i was beyond stoked after that run! two happy campers with two happy tankers. i’m very very very happy that we haven’t already packed our bags last week and said goodbye to the season and the mountains. it looked like winter was done, but luckily that one more dump came to help us round off the season for good. we will leave on saturday, until that, we will ride as much as possible. Categories: riding | Tags: freeriding, glaeserkoppe, jochspitze, planneralm, rotbuehel, tanker | Permalink. on the 3rd of march, a small part of the “p.i.e. – powder in the east” group, guido, roman and myself, went to the schneeberg to ride one of the famous steep couloirs of the eastern alps. originally, we aimed for the “Breite Ries”, which is a wide couloir with a very steep entry (possible entries vary between 35° and 50°), but due to heavy winds the upper area was very hard and icy. we didn’t have ice axes with us, so we decided that it was wiser not to try our luck on this day. the “Breite Ries” is the biiiig bowl a bit right of the center of the picture. but first things first. we started our ascent on a glouriously sunny day by using the chairlift (which saves about 1 hour of hiking up the slope) and then continued our way up on the fadenweg. somehow we missed the beginning of the hoyosgraben, but found another nice way up the mountain. the higher we got, the windier it got. when we reached the plateau, the wind was blowing heavily. we walked to the beginning of the “Breite Ries” and inspected the entry. another group of skiers also checked out the descent but decided to choose another way down. we also turned away from the “Breite Ries” and continued our hike to the “Lahningries”. 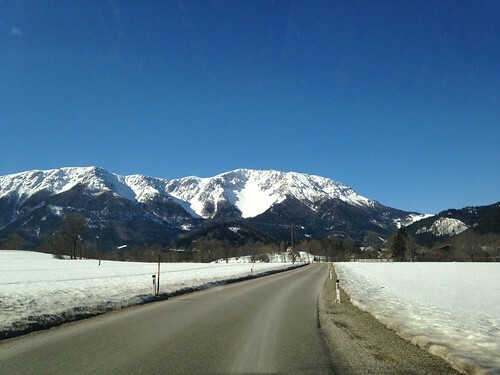 The “Lahning-Ries” is another steep face on the north-eastern side of the Schneeberg, with a slope angle of approximately 40°. the snow there was not ideal, pretty hard mostly, but there where softer spots as well. the “Lahning-Ries” ends right next to the official slope, so we didn’t have to hike back, whereas the “Breite Ries” ends kinda in the middle of the mountain and if you’re not lucky, you will have to walk all the way back to your starting point. although i was pretty tired already (maybe i shouldn’t do extensive workouts the day before hiking and riding :P), i made it down the steep face safely and was very happy afterwards. Categories: riding | Tags: austria, freeriding, schneeberg, splitboard touring, steep | Permalink. yesterday was the day of my first tv appearance. it was very interesting to take part in a discussion about freeriding and surprisingly, i wasn’t nervous at all. the show will be broadcasted for the first time on wednesday, the 23rd of january 2013, at 20:15. you can watch it in the livestream at the website of W24 and you will later on always be able to watch the show online here. Categories: coverage | Tags: coverage, discussion, freeride, freeriding, tv, w24 | Permalink.